Look at that caramel-y goodness. Drizzle olive oil over the exposed cloves, salt and pepper and then wrap in aluminum foil. Throw this little foil ball in the oven and in about 35-40 minutes (depending on how big your head is...That's what she...never mind), open up this flavor pack and gently squeeze the garlic from the bottom. The cloves will easily pop out. Add to your favorite recipe for a nutty garlic flavor, rather than that bitter garlic taste (which I also love, so don't knock the bitter garlic). Place about 30 cloves in an aluminum foil pouch, drizzle with olive oil and salt and pepper and do the same as above. You can also put the cloves in a saucepan, cover them with oil and slowly roast them on the stove top. I never succeed in this method. I always burn my garlic. 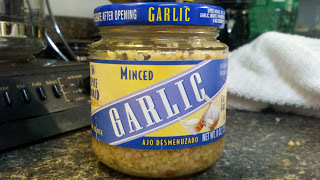 NEVER BUY GARLIC LIKE THIS!!!! Garlic like this sits around in oil for who knows how long, harboring bacteria. Also, most jarred garlic contains additives. I don't know about you, but I want to additive my own additives. I don't trust what other people do to food. Especially in this day and age. So if I want something added to my garlic, I will add it myself...thanks! Stupid Animal Stories: Part Tres!